Is that a designer version of the Walgreen’s rain poncho, or is he just making it look really cool? He’s wearing my $12 Muji raincoat! I bought mine at JFK a few years ago. I still have it and get LOADS of compliments every time I wear it. It’s the cheapest, chicest item of clothing I own. Not “stylish” to me but he’s got anyway style! That’s a very unexpected sartorial choice, but it suits him! Great style, and he seems so tall! The jacket is so cool! Absolutely in love with his look. No more words to say. It’s a MUJI raincoat. 15 euros. 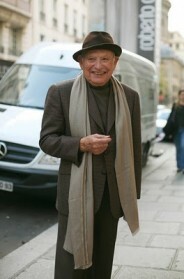 He reminds me of Bill Cunningham’s outfit. That’s a great look for him. Never before seen a rain jacket worn with such steez. The rolled sleeves are a nice touch. This guy looks INCREDIBLE. His outfit manages to look both effortless and well-thought out at the same time. So striking. I think this young man is wearing a beautiful Tuareg cross. Looks good on a denim shirt. this is my favorite photo ever! Very cool, great textures. I love that his look appears so effortless and uncontrived yet is original and speaks. Fashionable guy, I feel some close soul! This man has a very laid back cool vibe about him. Great street snap! i’m really into the 60+ woman in the back with the rockstud purse. looks like she’d put together some interesting outfits. I love his little hat. And the raincoat! Aw I thought he was coming from work. I’m like “Ohh where does he work??”. Because I wear a coat for work and people mistakenly think I’m a young doctor or scientist, haha. I wish, you guys. 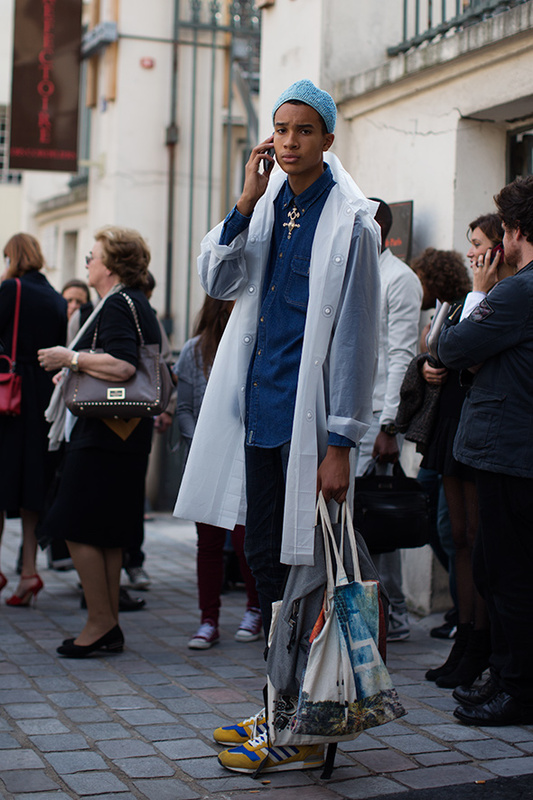 This men is Emile Fofana, 17 years old model (Success Paris). He has always an amazing style. This young fellow has made plastic raincoats inspiring! What an enjoyable blend of stylishness and urban funkiness. Nice style. Love the superposition of something light on a denim shirt, and the detail of the touareg cross. His rain poncho surely rocks the whole outfit. I’ve never seen anybody dress it with such a great style. that’s male model, Emile Fofana! i don’t know what other shows he did in the last menswear season, but he did Raf Simons & that is pretty special.